involvement with the squatting community in Twickenham (Mddx, England). The squat started in September 1972 and ended in August 1976. During the long discussions over the centre of Twickenham and its development, many properties in the Grosvenor and Queens Road area of Twickenham were being bought up by potential property developers and left empty for a long time. Being a local councillor, known for my help for the homeless and the underprivileged, and for helping those who seemed to fall through the net of the social security system I was asked to help the many squatters that had descended upon the area. After making many enquiries and calls on people in their 'squatted' homes, I came to the conclusion that I should become involved and try and help where I could. Basically they were fine people who had difficulty in coping with the pressures of modern life and could not afford the cost of what little accommodation there was in that part of West London suburbia. Like all sections of society the squatting group attracted a small group of misfits. It was those misfits that attracted, and got most of the media coverage. During this time there were many debates in the council chamber over the so-called Twickenham squatting 'problem'. I and one particular Conservative councillor, Cllr. George Tremlett, often clashed in debate. He had a far better command of the English language than I had, although to many, I won the argment but lost the debate. It is rather ironic that this particular councillor made his money out of young people and the squatters by writing books etc. on the contemporary 'pop' stars that would appeal to young people. One such debate I recall, rather vividly, was after I was photographed, and the photograph published, removing boarding nailed over the windows and doors of the squatted houses by council workmen after the squatters had left for work that day. The squatters' personal effects had been nailed up in the houses. During the following debate in the council chamber a few days later I was accused of being the Axeman of Twickenham. To this I rose to my feet to make a point of order. "Mr Mayor", I said, "It was not an axe, it was a claw-hammer". This remark caused much hilarity and laughter among the council members. 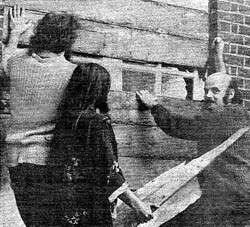 [In 1976, the last of] the squatters were evicted and the houses pulled down for development. I made many good friends during this period, and developed a respect for the squatters who were prepared to accept whatever advice I could offer at the many informal meetings we held in one of the houses. They paid bills such as the electricity, household and water rates on my advice, but were unable to find out who were the 'faceless' men of the property developers and speculators and so pay a fair rent for the use of the properties until such time as they would be required for pulling down for the development. The character and history of Twickenham were lost for all time when the houses were finally pulled down for the development to go ahead. Born in Hampton, second of five children, educated in the Borough. Served printing apprenticeship at Twickenham Printers. Established own printing company in Twickenham, moved business to Hampton Hill on expansion in the mid '70s at the same time becoming Sub Post Master for Hampton Hill. Became licensee of small hotel in 1987. An active and lifelong Socialist, joined the Labour Party in Twickenham in 1952, served on its management and executive committees. Member of the National Graphical Association. Elected to Borough Council as councillor for Hampton Hill. Appointed school governor of two schools. Former active member of Teddington Old People's Welfare Committee, a member of Twickenham Rotary Club playing a very active role. Chairman of a working man's club. Former Commissioner for the Scout Movement in the London Borough of Richmond upon Thames. Ken has an ancestors and descendents site detailing the histories of the Twickenham Cox and Elmes Families. He was also President of The Twickenham Club, and comments on current political events in his blog.